I had such an amazing weekend, I couldn't wish for better. walks throughout the city and in the nature. This is a gorgeous look! 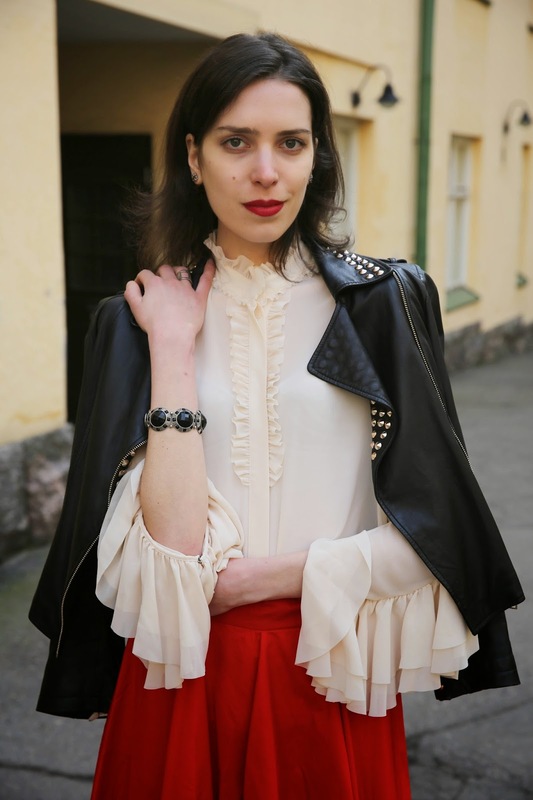 I love the romantic blouse paired with a studded biker jacket. What a great juxtaposition!!! Red suits you perfectly! I love your outfit, very chic! Very nice jacket and skirt. Enjoy your day out in the sun, and good luck with your exhibition! Love your blouse, especially the sleeves. Beautiful!! Amazing look, love the style of every piece and the same with colours! Enjoy your day and good luck with the exhibition! wow such amazing combinations! so classy and elegant! the skirt blew my mind! Beautiful look ! All is perfect ! Prelijepa kombinacija, pomalo bohemski (možda zbog kožne jakne i te bluze), stvarno divno izgledaš! Sretan Uskršnji ponedjeljak! Such a pretty midi skirt! I need to add one to my wardrobe asap! Love love love that shirt!!! LOVE the lace and the red together. A lovely femenine outfit, such a pretty blouse. The sun has arrived in your city, and the rain has come back to visit us here for a couple of days. The color of the skirt is amazing! Hope you had a nice Easter weekend! Love that leather jacket! gorgeous outfit! love the sleeves on that top! This is perfection from head to toe! Cool look, love the color of your skirt! So gorgeous! I love the sleeves of your shirt and the red skirt. Stunning look! Love your skirt! hey so nice blog. you look great. do you wanna follow each other? Oh yes, the classic color combination of black, white and red! very nice look! love your skirt!! and you look amazing! That is a perfect skirt. Great photos. Amazing chique outfit!! That blouse is so stunning and you look really good in red!! Love the pop of red in your skirt, bag and lips! So chic!